Road Safety Plan made in 2012. 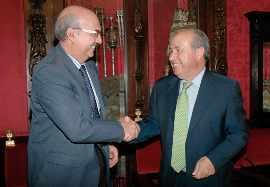 Cooperation agreement between DGT and Granada City Council. The Road Safety Plan is being presented on Tuesday 24th July 2012. It is being made in agreement to the criteria and metodology of the Road Safety type Plan made by the DGT. The improvement of urban road safety is only manageable with the cooperation of the Public Administration complex and all the social and economical agents involved, specially City Councils. The DGT, knowing these problems, and in agreement with the targets shown in the Road Safety Strategic Plan 2005-2008,and in the observance of responsibility of the State Administration in the circulation sphere has created the Urban Road Safety Type Plan, that must be a reference to the other mobility and safety responsibles to make their own Municipal Plans. On July 20th 2.011, the Cooperation Agreement is being signed between the Autonomous Traffic Headquarters Organism and the Excellency City Council in Granada, that made the creation of a Road Security Plan for Granada sponsored by the first one. Quantify the facts, know its causes, develop mofological and procedural solutions, and have zero victims as necessary condition for the sustainability of the mobility system, are the base to create this Security Plans. In this range, the Security Plan pretend to be a basic tool for the development and planning of Urban Road Safety. Starting from the accident rate, there have been suggested ideas, and its fulfillment will be essential to reach the main target of security and do the city of Granada safer. The companies Exeleria and Intra develop this Road Safety Plan in Granada in cooperation with the Educational Road Safety Center, the Center for the Integrated Management of Mobility, and the Municipal Police of Granada City Council. Main Target of the Road Safety Plan: Consolidate and improve the achievements obtained in 2011: to reduce the number of accidents and injured in the city. Period: until 2015. Includes short and medium term measures. Realistic Scenario: realistic targets following the current tendency, supported with actions to help consolidate this achievements. 12% reduction of accidents with victims in 2015 in relation to 2011 (more than a 30% in relation to 2010). Optimistic Scenario: high level of success with defined proposals that helps to reach even higher levels. 24% reduction of accidents with victims in 2015 in relation with 2011 (a 40% in relation to 2010). The increasing use of prívate vehicles has made a mobility model unsustainable due to the social and enviromental impacts associated (pollution, noise, fossil fuels, traffic accidents, etc.). To make this model sustainable, it is necessary not only to use the vehicle and energy in a rational way, or minimize polluted emissions and the noise, but to reduce traffic accidents. So, sustainable mobility must also be safe mobility. In the World, traffic accident is the first external death cause. The statistics are scary: 1.2 millions of death a year and more than 30 millions injured in the world, 45000 people die every year in a traffic accident in Europe and 1.6 million citizens are injured, being the first death cause in young people between 18 to 25 years and the second between 26 to 35, after AIDS. 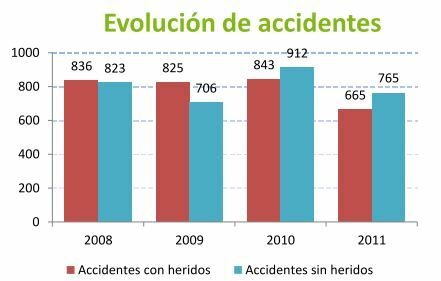 The evolution of the number of victims in an accident in urban zone in Spain and specifically in Granada, has a positive results in a downward tendency in the last five years, about the 3% annual. However, if we compare the Spanish situation with the rest of Europe, thirtheenth between 25 countries, this is not a good one.We have to keep in mind that the 52% of accidents happen in urban roads. We must say that accidents could be reduced considerably, as it is shown in the ambitious european Road Safety Plan that predicts a reduction of the 40% for 2015. In this scenario, non motorized and the public service and the implementation of measures to maximize the citizen´s security in the streets must be imperative targets in the local and supramunicipal politics. The improvement of urban road safety is just manageable with the cooperation of the Public Administrations and all the social and economical agents involved.The 25th November 2009 an specific agreement was signed between the Spanish Township and Provincial Federation and the Traffic Headquarters Autonomous Organism, in a road safety field, whose target was to cooperate to develop a better and more effective involvement of the City Councils in the design, realisation and evolution of the road safety politics. Improvement of the bidirectional communication between both Institutions, with data transmission and the access to the drivers and infractors, vehicles,victims and traffic accidents data bases. Cooperation for making of the Road Safety Plan, sponsored by the Traffic Department to Granada City Council with 55000 euros. Assignment of speed measures devices, power devices and alcochol rate. 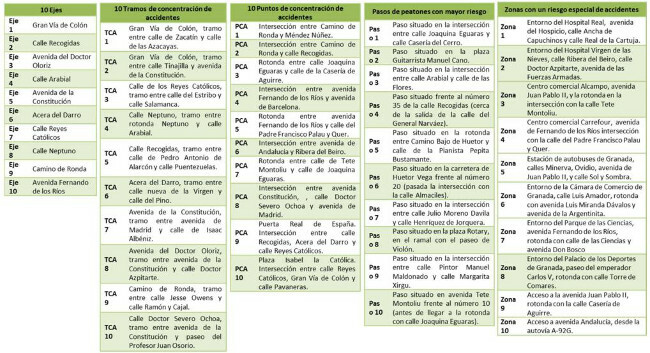 Special relevance has the Road Safety Plan (there have been chosen 10 towns in Spain: Granada, Córdoba, Gijón, La Laguna, Puertollano, Guadalajara, Mérida, Fuenlabrada, Ávila and Culledero) that will adequate to the guidelines made by the DGT, will be a big effort on compilation, treatment and detection of accidents and will propose actuations for users and roads, to reduce the morbidity both the structural and planning problems,and risky behaviour of citizens. By virtue of what is set out in, we can only express our gratitude for the sign of this agreement and to the Traffic Headquarters that will actively cooperate for road safety to be larger in our city. TAU is a complete software in continous evolution. Connects variables, makes risk zone maps, makes proposals and assesses settings. Includes operational data bases technologies, DataWarehousing and DataMining and a Geographical Informative System, defining a Decision Support System. We get the information from the statistics of accidents with and without injured made by the Local Police of Granada. It collects information relative to vehicles, people involved, presumed offences, security elements, etc. These statistics are sent to DGT and CGIM fot its processing. The CGIM has a software to insert the statistics in a operational data base. Once we have entered the data, we process them to detect and correct operational mistakes and we export it to the Information System (Geographical and Data Warehouse) When this process is finished, we use software SIG y DSS to generate maps, statistics, charts, decisions tables etc. Everything is connected with the BI that, in a continous process, we are extending in the rest of areas in Mobility. You can download a PDF the Executive Resume of the Road Safety Security Plan in Granada. 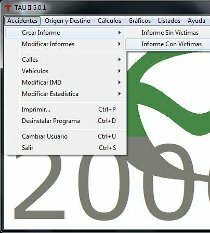 In the following charts and tables you can see the evolution of the number of traffic accidents with or without victims. 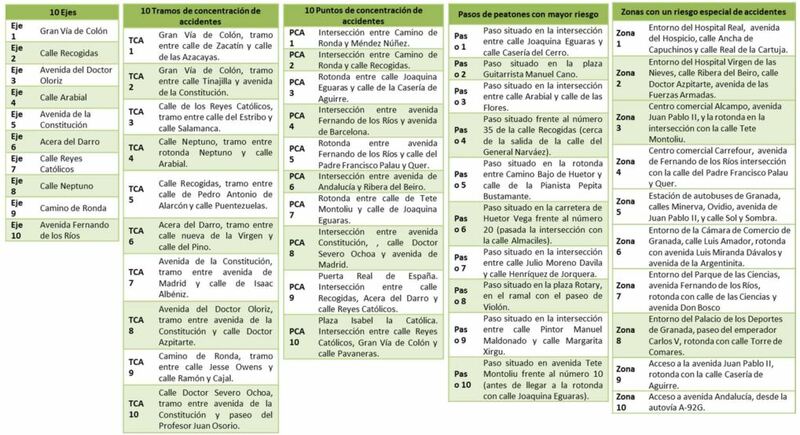 To elaborate it we have obtained the data from the Granada Local Police Memory and the Road Safety Plan in the City of Granada developed in 2012 and followings annual accident rate studies. In the following chart we can see the traffic evolution (both with victims and without victims) in the last years. Harmfulness evolution (mild or severe injured and dead) in the last years. We must have in mind to understand these charts that the data is obtained from the differents actuations of the Granada Local Police, so the accident won´t be registered if the Police was not being required. 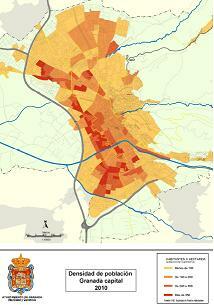 The demographic indicators maps allow us to know the distribution, dynamic and structure of the population in the city of Granada. This helps us to understand the behaviour of the population in its urban mobility. The data is obtained by the Inhabitants Registry made by the National Statistic Institute. The date of reference of the used data are: 1 January 2010 and 1 January 2005 (growth rate). The different census sections at the edge of the city have been defined by the city center to reduce the surface in the calculation of the density of population. To cartographic the indicators it has been used the Geographical Information System, with the free software gvSIG.